From the mountains of central and southern Europe comes this large and ornamental, strongly aromatic perennial plant. 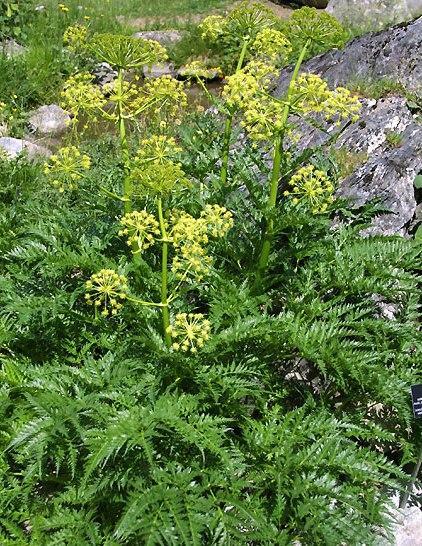 It has handsome and decorative, shiny, long-pointed, fern-like foliage and bears in late spring large numbers of yellow turning cream flowers. This is a plant that certainly has WOW factor. It will really draw attention to your garden and it is well worth learning to get your tongue around the name. A rather stout perennial Umbel of considerable architectural value. 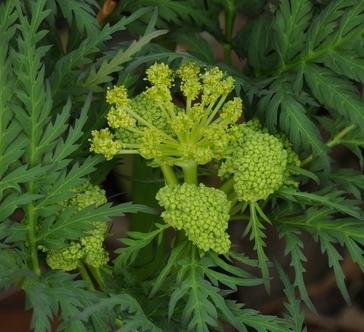 Attaining a height of 100-150cm, with large elegant leaves consisting of many much divided leaflets, below the large compound umbels of yellow turning cream flowers. Best in part shade in a drained moisture retentive preferably neutral to acid soil. The very filigreed highly varnished foliage does die down quite early so don’t be too alarmed when in late summer the foliage starts to turn. It is found growing wild in the Alps and Pyrenees. In the Eastern Pyrenees , the young leaves and stems are used in the preparation of liqueurs or eaten fresh in salads.